Patty's Utopia: If You Thought That Being a Salsa DJ is Easy, Think Again. Two weeks ago I was invited to attend a party at a known Salsa Ballroom in the heart of Capitol Hill in Seattle. I was immediately interested in attending because the featured DJ for that night was brought all the way from Denver. Unfortunately, he had a minor accident (I read on a Facebook update that he was okay by the way) and he was unable to make it to Seattle. That night, a local DJ came to the rescue and as I was listening to his mixes I started thinking about the necessary skills to be a salsa DJ. You see, in order to be a great Salsa DJ, they need to have a good understanding of how the backbone of Latin music works. 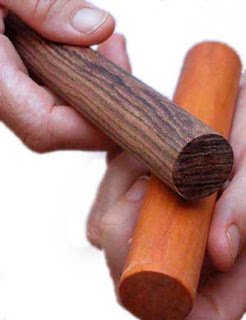 With these claves a member of the band plays the rhytmic pattern that is known as "La Clave". They are essential in order to keep the bass, the piano, and the rest of the percussions from missing the beat. When Salsa DJs put together a mix of songs, they have to remember that this Clave has to be perfectly synced between songs in order to have the dancers dancing smoothly. Many DJs in the Seattle area are still trying to get the grasp of this, and I am sure that eventually they will, but in the meantime, next time that you go to a club to listen to a DJ, and especially a salsa DJ, think of all the time that many of them have spent learning and listening to this music in order to bring us a nice mix of songs for us to enjoy! And now, I leave you with a very good mix of salsa music that I found on YouTube. Come on my friends! It's time to get your bodies moving! Congrats! So excited for you, paisana!